Repetitive motion and overexertion are the biggest risk factors facing American workers. The one-day NSC Ergonomics course will teach you how to reduce the number and severity of musculoskeletal injuries in your workplace through a practical and effective program. Discussions, demonstrations and exercises explain the importance of keeping employees free from ergonomic injuries. 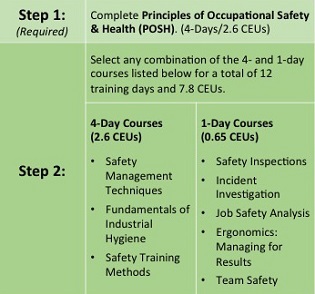 You’ll also learn how to recognize risk factors, conduct an ergonomic worksite analysis, evaluate and rank hazards, and select appropriate control methods. This course is designed for business owners, managers, supervisors and HR professionals. Register today and gain the skills you need to take control of the number one cause of workplace injuries, reduce costs and improve employee morale for your organization. Completion of the Ergonomics course earns you 0.65 CEUs towards the NSC Advanced Safety Certificate, a nationally recognized safety program based on proven best practices.